Enjoy the new Visitor Route Experience where one ticket gives you entrance to the historic Manor House museum, the original Cloete Cellar, a cellar tour, wine tasting and Spiegalau Crystal wine glass. The Manor House is the original Cape Dutch Homestead, beautifully preserved so you can look back in time. At the Cloete Cellar you’ll find a fascinating and unusual collection of historic wine and archeological equipment as you learn more about this area, the wine and the history of the estate. It’s an enthralling and unforgettable tour that aims to show, not tell. The Groot Constantia wine range boasts an exquisite array of wines that pay tribute to the amazing terroir and climate that the estate finds itself in. Each wine contains notes that make it fit extremely well into its category and stand out at the same time. Despite their uniqueness, each wine has a common characteristic, that of being a fantastic and easy wine to drink while at the same time hiding interesting and complicated tasting notes within its bottle. Prepare your palette to be amazed with the Chocolate & Wine pairing, that has unlocked interesting flavour combination by Groot Constantia with the help of a team of chocolatiers who came together to collaborate on creating not only a sweet way to taste wine, but also a way in which some of their wines with more complicated notes could be tasted and understood. Each wine has been delicately paired with a chocolate and the expertly trained staff at Groot Constantia guide you through the tasting. 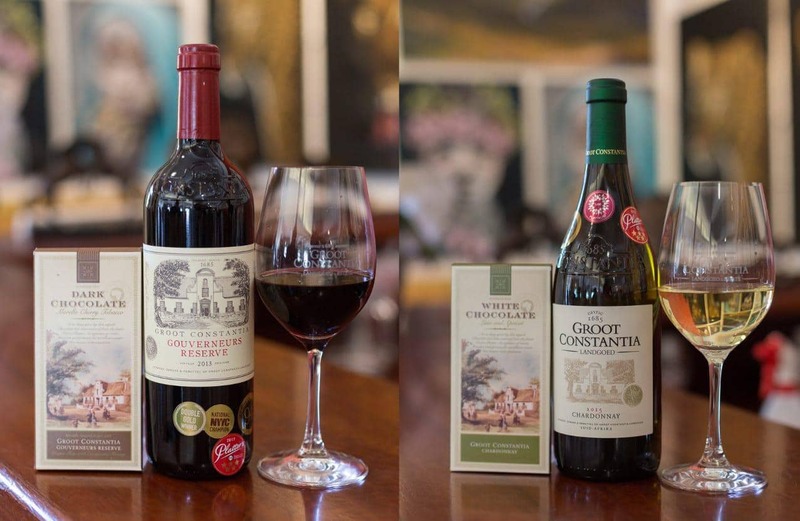 Groot Constantia has six options from which they select a daily five flavour pairing option, depending on stock availability. The Groot Constantia Wine and Chocolate tasting is a truly unique experience that should be on every Cape Town bucket list as an experience that is not to be missed. Not only is it unique in its presentation, but does a wonderful job in educating and highlighting characteristics of our favourite wines that we so often miss. Two of the five wine and chocolates you can savour at the Groot Constantia wine and chocolate pairing. Download the VoiceMap app and you’ll have three free self-guided audio tours to choose from. These smart tours follow you via you’re phone’s GPS so you’ll hear about what you’re seeing as you walk. You can explore the museum, vineyards and cellar with the three Groot Constantia tours and as an added bonus they have free Wifi on site! Be sure to download the app before you set off and take your own earphones with you. Groot Constantia has two remarkable restaurants on site: Jonkershuis and Simon’s. While the former serves decadent breakfasts and lunches next to the fire place or uner the amcient oak trees, the latter has relaxed Al Fresco or A La Carte meals and special outdoor picnics.